I never liked Valentines Day. Well, that isn't completely true. I liked it as a kid until I hit middle school. I loved getting some cute little heart shaped goodies in my lunch box from my mom. Now that I'm a mommy, I'm liking Valentines Day again. I think it should be a day just for kids. I wanted to share some of the Valentines Day projects and things Moose and I have been doing. Moose had a bunch of her friends over and they made these butterflies. Well, technically one is a caterpillar because her one friend did not want the wings on. Toddlers are so funny. I took paper rolls and painted them ahead of time. I also punched holes for the antenna. 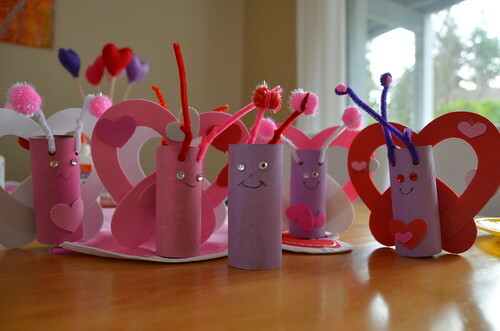 I have found that toddlers do best with crafts that can be done in five minutes and kept really simple. The kids were able to put in their pipe cleaner antenna, affix the sparkly eyes, and decorate the foam heart wings themselves. The best part was I already had everything for them. The hearts were left over from last year, we always have pipe cleaners around, the jewel eyes were from my scrapbook stash, and the rest was from Moose's random crafty box. Moose still wanted to do some more crafting, so she got some of the left over hearts and started gluing lots of pompoms. 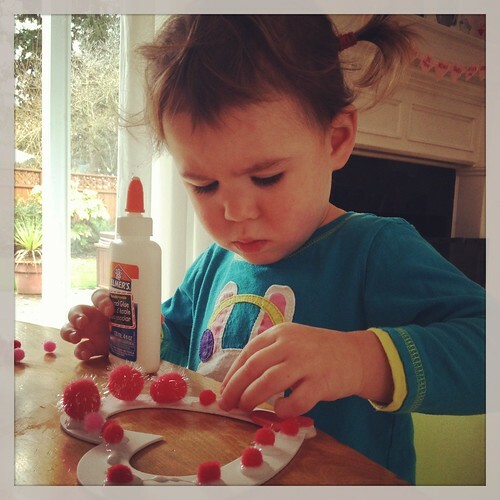 The girl used lots and lots and lots and lots of glue. It was a mess, but she had so much fun so it was worth it. 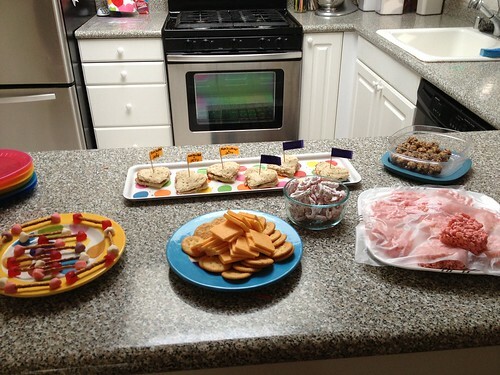 I wanted to share some of the snacks I made for Moose's friends. I tried to keep them fairly healthy, but all the really cute ideas seem to be candy related. 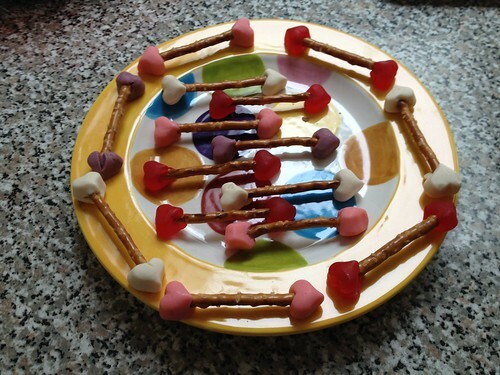 My favorites were the arrows made from pretzels and little heart gummies that I found. A lot of the hearts got eaten, but the sticks were often left behind. 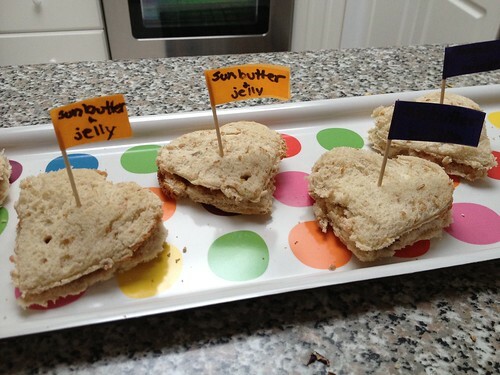 I also made little heart shape sandwiches.